Ari - Luna gyerekekből még van egy blue belton és egy tricolour kisfiú (Mr. Black és Mr. Green) és egy blue belton kislány (Miss Red) eladó! Mindhárom kiskutya nyugodt, aranyos természetű. Ajánlom családi, hobbi kutyának. 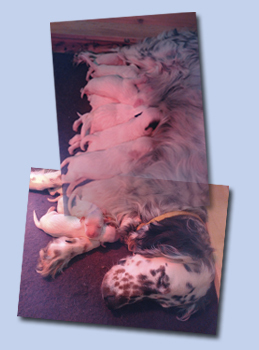 Our puppies were born on 04 September 2015 out of our workinglinie! We have 4 males and 4 females. I can offer them to the active family or if anybody look for a good hunting dog, they will be a good choice, too. 4 lány és egy fiú!!!! Angol típusú, kiállítási vonalú kölykökre előjegyzést felveszek. Még 2 kan (blue belton és egy tricolour) és 1 tricolour lány az előző alomból keresi szerető családját, aminek nagyszerű társaik lehetnének. 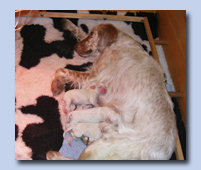 Such a log time we wait and now were puppies born out of Luna on 01. 02.2015. We are very happy!! Azóta több kiállításon is részt vettük Nadallal és Lunával. Miskolcon a Hungária Championt, Szentesen pedig a Show Championt is befejezte Nadal. Szentesen Nadal JH-ban 2.helyezett Baranyai Katával, gratulálunk! Köszönöm a jó társaságot Líviáéknak, és a szép napot illetve a fürdőzést a szervezőknek! 2013.05.18 egy újabb fantasztikus nap volt az életünkben! Budapesten megrendezésre kerülő világkiállításon Angel az osztályát megnyerve Veterán Világgyőztes lett! Nagy örömömre Angelt, tenyésztője Leen vezette fel és együtt osztozhattunk a sikerekben! Leen elhozta Angel fiát is, aki a nyílt osztályos kanok között 1 helyezett lett, majd utána RES.CACIB és ezzel VICE WORLWINNER! Két másik kutyám is képviseltette magát, Justin és Nadal, akik nem értek el helyezést, de büszkén vezettem fel őket egy rangos mezőnyben. Gratulálok a győzteseknek! We participated in a well-organized clubshow with a great atmosphere in Austria Baden. The weather was very cold és was a litle nit long day, but recoup myself a good company and a excellent results! Nadal won at the open class, and he begin the titel of austrian champion. 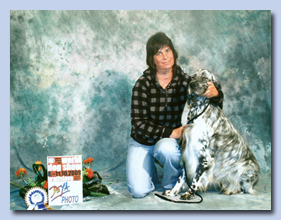 Angel won at veteran class and after became the titel of VETERAN BEST IN SHOW, too. I wouldl like to thansk a judigment of Penny Williams! Meldor-Sett Lucious Lea, who were born in Poland. 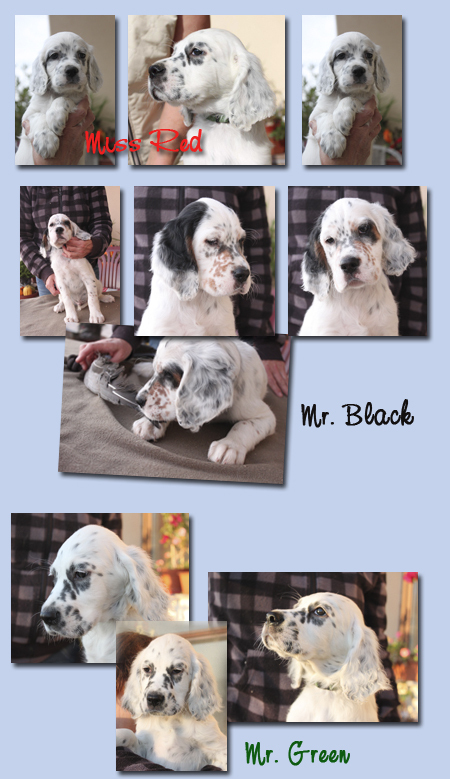 Congratulation to the puppy class winner! We are visit the Setter Clubshow on Komárom. Our boys got a great results, I am so proud them!!!! We have a orange male for sale. We put some new pictures to the site of litter. 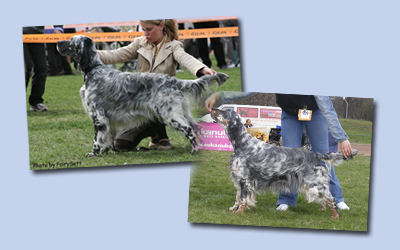 Nadal was shown at the 2-day-CACIB show in Székesfehérvár in September. On the first day he got the titles CAC; CACIB; BOB. On the second day Res. CAC, Res. CACIB. He was handled by Evelin Karnis. Big Thank You for her professional handling! 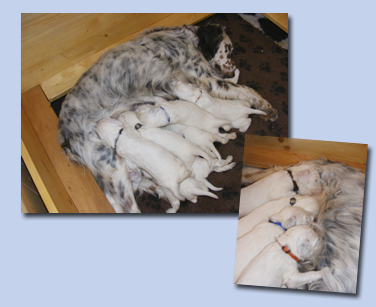 We are very proud of Dasty (the father of our present litter) who made the Water-Field Trial in 2. prize this months. 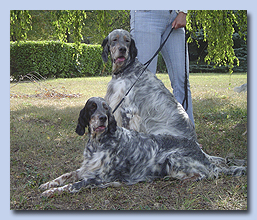 Why it is so special, is that it was in 1976 the last time when an English Setter was entered for such a test and passed it!! Congratulation to Jozsi on this great result! The pups are already two weeks old... We took photos of them. We seem to look for loving homes for an orange girl and boy and 1-1 light blue or tricolour boy. 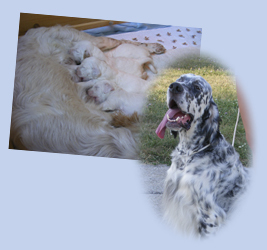 We are visit The Slovakian Setter Club special show in Trnava. Nadal got the 2nd place in open class, but Justin won the champion class and got the Best Male title, too. Justin finish the titel of Slovakian Champion! We want to thanks a judging for Marián Konecny! On beginning of september born our working litter out of Daisy and Dusty. 2 boys and 2 girls are waiting a lovely family! Any Inquring are welcome! 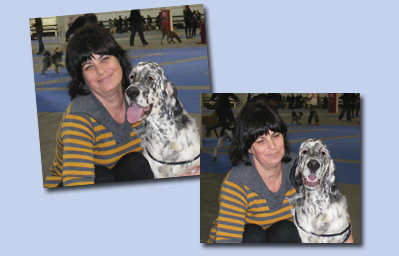 I was so proud of Daisy, of course she is not a tipical showdog, but the handling with her was worked out very well. 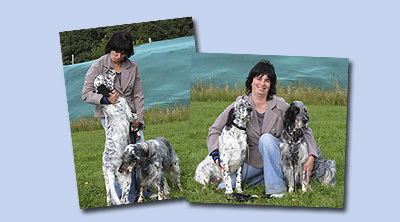 I would like to say thanks to the british judge John Thirwell, who was so friendly and patient with my dogs and thanks to Laura because of the wonderfull pictures! We took part in the Slovakian Club Show on 27 May 2012. We had a very nice, sunny day with friends. 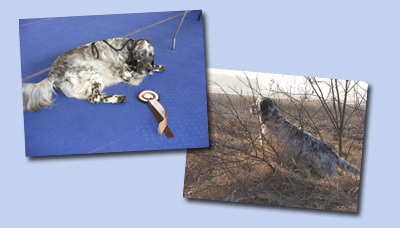 Nadal was entered in Open class which was his really firt in this adult class and he was placed second out of three right after an Inter Show Champion dog. Thank you Mrs Marianne Gyarfas for the judgement. Our new hunting dog, Daisy passed the Natural Ability Test in April and she did 6 points on the Derby Field Trial. I would like to thank Miss Katalin Noveczki for training her! I am very happy that I have a setter capable of working. We had our first show in Cegled this year. We met our dear friends. 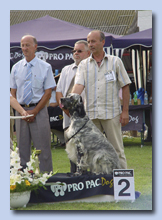 Nadal did very welll, he went Best of Breed from intermediate class. It was his first BOB title! Következő utunk Lengyelországba vezetett, Opole CACIB kiállításra. Meglepett a kedves légkör, szép eredménnyel tértünk haza. Nadal osztálygyőztes lett, Justin pedig a Res CACIB cím mellett interchampion cím várományosa lett! We took part in the fantastic two-day-long Dracula Show in Marosvásárhely this year, too. Justin and Nadal came home with wonderful results. Nadal won the Romanian Junior Champion title and the qualification for the year 2012 Cruft's! Radu Daniela, Chie Ejima and Sándor Szabó. Thank you to Niki and Timi for their help in the handling! 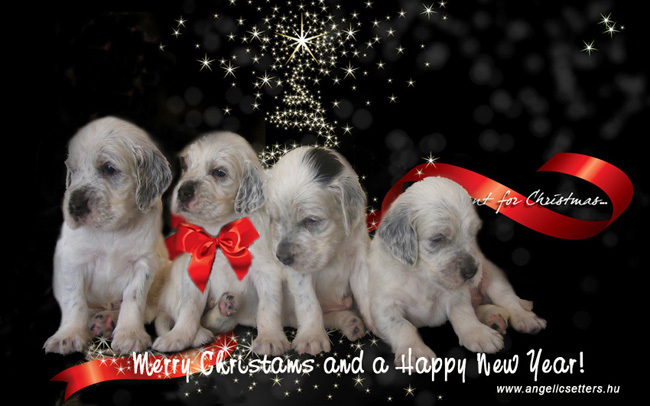 And we would also like to say thank you to the breeders, Ildiko and Laci (Slow Fox Kennel) and Brian and Margaret (Swannery Kennel) for these beautiful dogs! - "Nadal worthy rival of the Champion male." I am very happy, because Nadal finish the titel of Hungarian Junior Champion! Thanks to the judging to Marianne Gyárfás! And of course I want to thanks to Emese Boros for the nice pictures!! 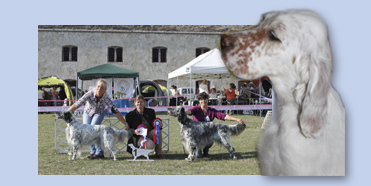 We spent two nice days in a picturesque environment in the two days dog show organized on the 23rd and 24th April 2011 in Szilvásvárad. I am delighted that my husband has always been ready to come with me there. Our dogs were judged in a strong competition, in a good humour. 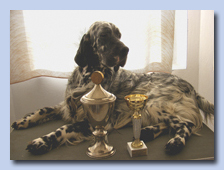 with Cruft's 2012 qualification and he also became Hungarian Grand Champion! Big thank you to Mrs.Nikki Ruigrok (IRL) and Mrs. Susan Stone Amport (CH) for their judgement. I also want to express my thanks to our hosts in the Aranykehly-Inn in Dédestapolcsány for their kind hospitality where have booked our rooms for years. Last but not least my thanks go to the board members of the Hungarian Setter Club for their great job! :-)"
We visit a two good spirits and succesful shows with Justin and Nadal (Dombóvár and Satu Mare)! I was very happy, because it was first time, that Nadal working with me together so pretty. Thansk to the judging to Vilmos Kardos and Petru Munteanu! 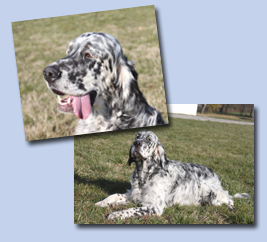 On the 26th March 2011 we participated on the Field - Trial / Hunting Ability Test organized by the Hungarian Setter Club in Dabas. We had a lovely day, nice weather, good humour. Nadal passed the Hunting Ability Test at age of 10 month. 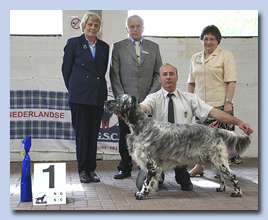 Motivated by his success, we would like to go on and to show him in the gundog work too. Big thank you for the work done by the judges, people assisting us and the organizers! 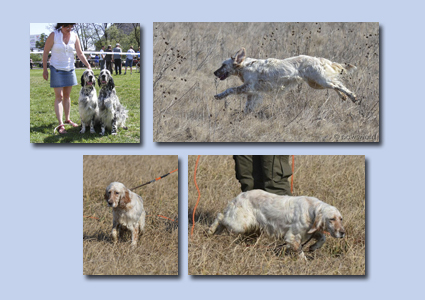 I would like to thank to Franciska for her helping us in training Nadal and showing the world of gundogs to us. 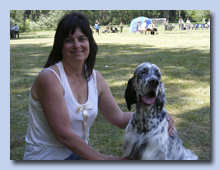 She is inspiring us and now I can understand what do her words mean: "Trust your dog"! Beginning our new year and what a result!!! We are very proud of our Justin, because he got the titel of Champion of the Champions again. 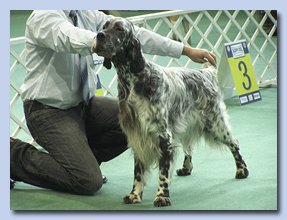 The Judge tolld, that he have a chance to send 3 dogs to the Best in Show, than the 3rd can be was the English Setter. We want to thanks to Vilmos Kardos for a judging! We put some new pictures from Nadal! 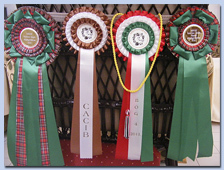 We put some show results, what we are forget early: Komarom CACIB, the Dunaujvarosi CAC show and the results of the Budapest CACIB. I am very proud to Chanel great results. :-) Thanks for the photos to FairySett! Nadal is growing up, but he is a lovely clown. He is simling all day. The handling is not easy for him, but I hope he will be better in the junior class. We are spending a 3 days in Tirgu Mures, where Nadal can startet the show carrier and Justin got the Romanian Champion. I want to thanks to Piros company and the patience of my husbend! was a small town, 50 kms from Birmingham. 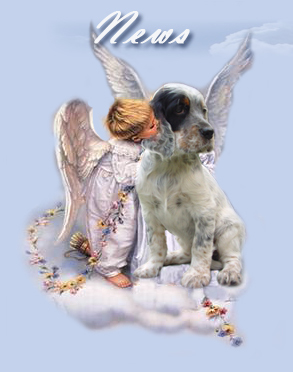 I have always dreamt about having an English dog from foreign bloodlines. The English have put strict rules on the import of live animals to Hungary. It would have been very expensive to fly there so we decided to go by car sharing the expenses of the journeywith the other travellers. We could speed on the highways and crossed the Strait of Dover by ferry. We bought the ferry ticket on the internet well in advance because it was cheaper this way. 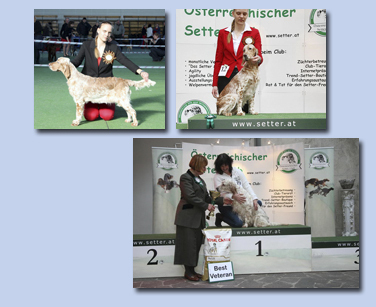 - Justin and Chanel won his/her class by Setter Clubshow, and Justin got the titel of Clubwinner, too! 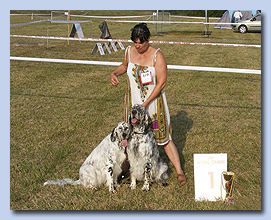 We was very happy, because Sweety (sister of Justin) won the BEST IN SHOW!Thanks to the lot of happiness to the other setter's owners and to the organisator, who give this beautiful place!!! 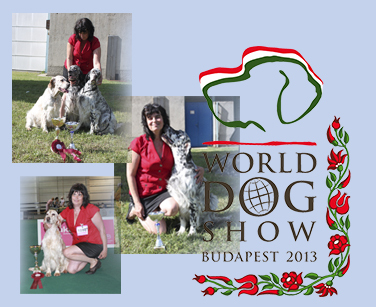 - The dogshow of Miskolc Justin finish the titel of Hungarian Champion. Chanel and Justin got the titel of Hungarian Show, too. I would like to thanks to Niki for the handling, Balázs and Miklós for the many nice pictures! 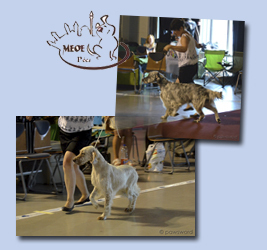 it was a nice show with lovely setters's owners! - I was very happy, when Justin won again the titel of Champion of the champions. Chanel got two champions (the Hungarian and Romanain) in this year. Thanks to Ildiko and Laszlo to the many help! - My last shows were lucky and less lucky as well. In Kolozsvár I was in the seventh heaven with my BOG, Chanel got the Romanian Champion title and I could meet Holder and Catalina. My warmest congratulations to his first junior winning title. It was nice to see that he became a young Titan. It was a very nice show of a very good atmosphere. I thank Zsombor for his help!! I LOVE THE BEAUTIFUL TRANSYLVANIA! In Zágreb Justin was not good enough to "pass the eye of needle", but at least Channel won her class. The worst was the show in Budapest. 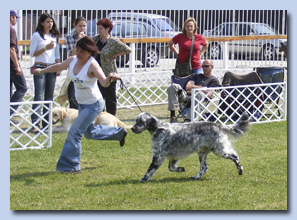 Both dogs and their handlers had difficulties to accept the unusal unpleasing judging. Only meeting my dear friends made the atmoshpere nice. Congratulations to Zoe's nice result got in her first show. I am sorry that I could not meet her in person. Thanks Ildikó and Laci for the professional handling! - The two weekend we was a show in Komárom and Setter Clubshow in Bratislava. Justin won his first CACIB after the Chanel. :-) We want to congratulation to the nother hungarina success. I was very happy, when Macho won the titel of BEST IN SHOW, because he is the father of Justin and "husband" our Chanel! - Chanel got the titel of Hungarian Champion Kecskemét! We was vey happy can we meet our Smile, who is a now a "Big boy". We are so sorry Szandi, because she don't got any place in the Junior Handling. They was very clever and beautiful. - success of Debrecen!!!! We would like to congratulation for Szandi, who got the second placa in the Junior Handling with Justin! We want to thanks to all friends, who make a unforgettable this day!! - result of Esztergom... Thanks for the lovely pictures to Dorottya Máthé! - We had a wonderful day in Holland.We would like to thanks to the judges Mrs Fran Grimsdell (GB), Mr P. Woodland (GB) and Mrs S Ackerley (GB) for the great result and the handling to László! "ÉV LEGEREDMÉNYESEBB FIATAL ANGOL SZETTER KANJA" megtisztelő címet. 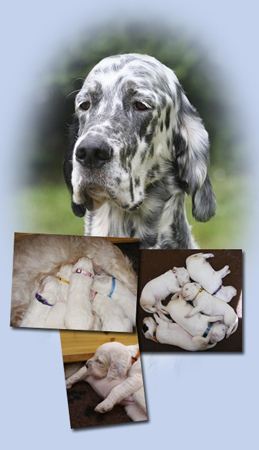 - "Little Angels" (Setters puppies) are due to be born in the middle of January. - I would like to welcome everybody to our new website! 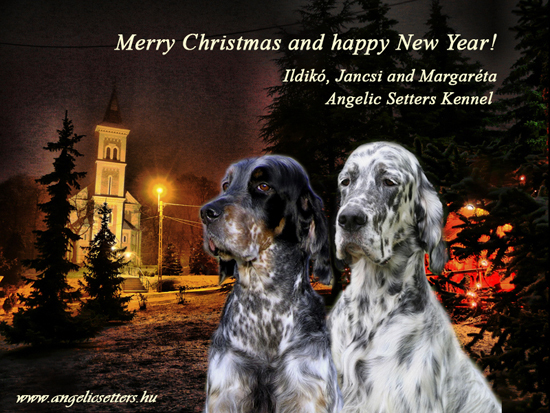 We wish a happy, succesful New "Setters" Year to everybody!